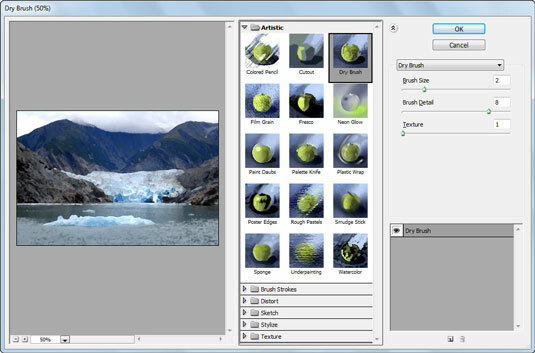 Filters, also called plug-ins because they can be installed or removed independently, change the look of your Photoshop Elements image in a variety of ways. They can correct less-than-perfect images by making them appear sharper or by covering up flaws. Filters also can enhance your images by making them appear as though they’re painted, tiled, photocopied, or lit by spotlights. Make sure to create a backup of your original image if you plan on saving your filtered one. Use filters to correct image imperfections or to completely transform images. In either Edit Full or Edit Quick mode: From the Filter menu, choose your desired filter category and then select a specific filter. In Edit Full mode only: Choose Window→Effects to open the Effects panel. Click the Filters button at the top of the panel. Select your filter category from the drop-down menu to the right of the buttons. Double-click the thumbnail of your desired filter or drag the filter onto your image window. In either Edit Full or Edit Quick mode: Choose Filter→Filter Gallery to apply one or more filters in a flexible editing environment. The Dry Brush filter applied to a landscape scene in the Filter Gallery. Even when you’re using the Filter Gallery, make a backup copy of your image (or at least create a duplicate layer) before you apply filters. Filters change the pixels of an image permanently, and when you exit the Filter Gallery, the filters you apply can’t be removed. 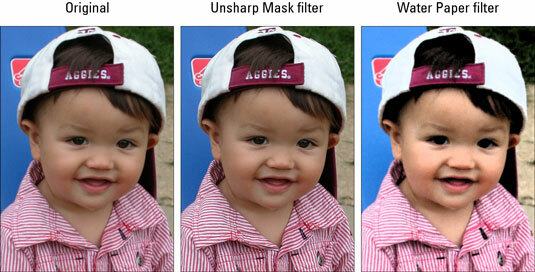 Corrective filters usually fix some kind of image problem. They adjust color, improve focus, remove dust or artifacts, and so on. The basic appearance of the image remains the same. Destructive filters are used to create some kind of special effect. Pixels are also modified, but the image may look quite a bit different from its original. These kinds of filters create effects, such as textures, brush strokes, mosaics, lights, and clouds. One-step filters have no options and no dialog boxes; select the filter and watch the magic happen. Multistep filters act almost like mini-applications. Choose the filter to open a dialog box that has options for you to specify. The options vary widely depending on the filter. A multistep filter appears on the menu with an ellipsis following its name, indicating that a dialog box opens when you choose the command. You can often get better effects when you apply a filter just to a portion of an image or layer. For example, you can blur a distracting background so that the person in your image gets due attention. Or, you can apply an Ocean Ripple or Wave filter to the ocean, leaving a surfer unfiltered. Selectively applying a filter can prevent an image from looking overly manipulated.